Marie WOLFROM, “Willy Mutunga, a life long activist”, Mambo!, Vol. XVI, (1), 2019. Genesis of an Activist Willy Mutunga hails from a modest background. Born on June 16 1947 in Kilonzo, near Kitui (130 km from Nairobi), he was second in a family of eight children. His parents, of Kamba ethnicity, were illiterate, though his father, a tailor, knew how to count. As a brilliant student, he benefited from family and state solidarity to fund his schooling, which was a common feature during this early independence period when new African states wanted to establish local elite. He attended Kalawa primary school and later Ithookwe primary school, which were both non-religious institutions. He pursued his secondary school studies in Kitui with the help of a county scholarship. He then joined the prestigious Strathmore high school in Nairobi, the first multi-racial institution of Kenya, founded in 1961. Strathmore was a Catholic school set up and financed by Opus Dei that preached “racial harmony”; there, Willy Mutunga made friends from different backgrounds and communities. “I owe my education to the community,” he emphasizes today. “You can see why I have stayed on that route of humanity and social democracy”. From this period, he has had a deep rejection of Kenya’s widespread “tribalism” and a real curiosity for different spiritual confessions. He was baptized in the protestant faith at 9 years old, but he turned away from that church because its hostility towards traditional animistic practices shocked him. As a college student, he converted to Catholicism before turning to Islam in 1981, seven years after his marriage with his first wife Rukia, who was a Muslim. This spiritual search, which may be perceived as an internal freedom with regards to different religious dogma, made him say that he is “a man of all faiths”, but these words were misunderstood in Kenya and taken up as religious inconsistency. His open and independent personality would find at UDSM the intellectual and political training he thirsted for. In the seventies, UDSM was the “Mecca of Revolution”, Willy Mutunga likes to recall. From South Africa’s Africa National Congress (ANC) to Mozambique’s Liberation Front (FRELIMO), all African liberation movements met there and debated together. The future Ugandan president Yoweri Museveni attended the university together with the Sudanese John Garang. Progressive international professors, such as Canadian John S. Saul and Walter Rodney, the Guyanese historian and political activist, also converged there4. In Dar es Salaam, Willy Mutunga was a diligent participant in the debates that took place every Sunday, ironically baptized “the Rodney Church”5. He described himself as a “sympathetic but also a critic” because he was wary of dogmatism. His two stays at UDSM (1968-1971, then 1973-1974) left a lasting mark on him. “That is the time when my ideological and political beliefs were shaped”. On his return to Kenya, he became an activist for social progress, political freedom and Pan-Africanism. After his Law degree in 1974, Willy Mutunga was immediately recruited as a Law lecturer at the University of Nairobi (UoN). He joined a world in constant restlessness against Jomo Kenyatta’s authority, the first president of independent Kenya, who had imposed a single party system. Every year on 2nd March, students then commemorated the assassination of J.-M. Kariuki, a very popular politician, which came to be known as the “J.-M. Day”. On December 31, 1977, the arrest of Ngugi wa Thiong’o, a lecturer, writer and thinker, reinforced the tensions between the regime and the university. Imprisoned without trial, Ngugi wa Thiong’o stayed in prison for a year and was not allowed to go back to the university upon his liberation. Daniel arap Moi’s ascent to power at the end of 1978, after Jomo Kenyatta’s death, changed nothing. Students and teachers’ mobilisation to obtain Ngugi wa Thiong’o’s reinstatement was organized within a labour union: the University Academic Staff Union (UASU). Willy Mutunga was UASU’s Secretary General. After its banning, in July 1980, UASU continued as a secret organization called the “December 12th Movement”. The publication of a political pamphlet by the movement led to the arrest of Willy Mutunga and many of his colleagues, including the renowned scholar Alamin Mazrui, to whom he remained close. 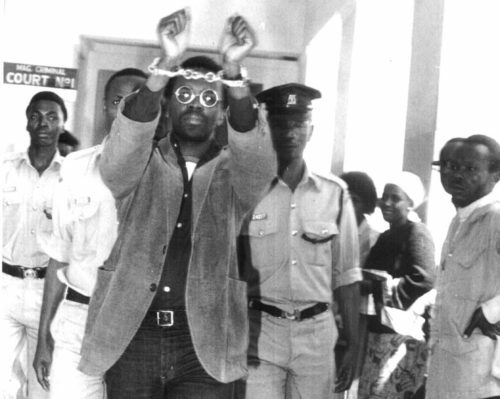 Arrested on 10 June 1982 and interrogated for two days without violence, Willy Mutunga was finally charged with “holding a seditious publication” and arrested without trial. He was detained for sixteen months, without ever seeing his wife Rukia nor his two young children. He could not even attend his mother’s funeral, who passed away during his detention. Willy Mutunga decided to study law because, to him, being a lawyer was a “prestigious” profession that offered “future perspectives” for Africans, who had been denied for too long the right to practice it (Ross, 1992)6. At that time, he did not bring up the activist possibilities of the profession, nor promoted any wish to master the “weapon of the law”7 that he would, nevertheless, use later in his career. He was released from prison on 20 October 1983; but having lost his teaching position at UoN, he resumed his career as an advocate – he had, indeed, briefly practiced at Kitui in 1971 and 1972, after establishing Mutunga and Co Advocates firm in Nairobi. At the same time, he committed himself to the Kituo cha Sheria association of legal assistance. These complicated years were used to reconstruct his personal and professional life brutally interrupted by imprisonment. Politically, this period is marked by the hardening of Daniel arap Moi’s regime despite of all forms of opposition. In 1982, an amendment to the constitution (section 2A) made Kenya a de jure single party state. After an attempted coup failed in August1982, many opponents were arrested, tortured and imprisoned for years. 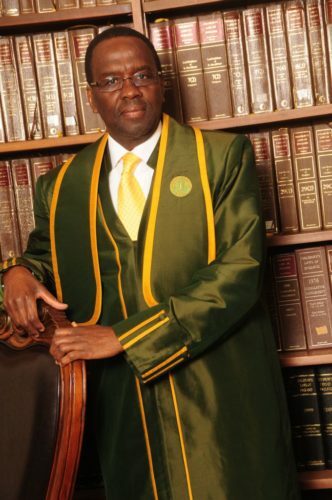 During the last years of this troubled period, Willy Mutunga decided to “think about the situation in Kenya”, an objective that made him leave for Toronto in Canada in October 1989 and pursue a Doctorate Degree in Law. There, he remained a dedicated activist, connected to the Kenyan diaspora, notably to his former student in the Law Faculty, Makau Mutua, who had relocated to the United States in the early 1980s. He witnessed the fall of the Berlin Wall and the collapse of the communist system which, he emphasized, caused a “shock” for all the left-wing activists. From 1990, Willy Mutunga joined a small group of Kenyans who aimed to create a Human Rights organization. According to him, it was an opportunity for the radical activists to come out of their “ideological confusion”. The Kenya Human Rights Commission (KHRC) was registered in April 1992 in Washington, for Kenya was not an option for establishing such an institution. It was presided by Makau Mutua; Willy Mutunga was its Vice President; and Maina Kiai – another Kenyan Law student who was close to Mutua and lived in the United States – was its Executive Director. In September 1992, the commission moved to Nairobi. On his return to Nairobi, Willy Mutunga, already Vice President of the Law Society of Kenya (LSK), succeeded the Advocate Paul Muite at the head of the organization in 1993. Established by law, the LSK was a professional organization that united all practicing advocates. Besides the training and the supervision of its members’ professional ethics, its official role was to assist the government and the public with legal matters. Young protesting lawyers interpreted the rather vague formulation of LSK’s role in its widest sense in the early 1990s. Paul Muite and Willy Mutunga quickly understood how useful the LSK would be: it was indeed an organisation independent of the government and sanctioned by a law that prevented its overnight closure, unlike any normal organization. They used the LSK to campaign for the abrogation of section 2A of the constitution and the restoration of multi-partyism. With his double membership at KHRC (as Vice President from 1992 to 1997, then as Executive Director from 1998 to 2003) and at the LSK (which he presided from 1993 to 1995), Willy Mutunga played an essential role in creating a new Human Rights language in Kenya. He diffused his ideas in particular by means of op-eds in the Daily Nation newspaper, along with other activists like Mugambi Kiai , brother to Maina. The KHRC also published numerous reports, specifically on the situation of political prisoners or land issues – a crucial problem in the country. The commission got closer to opposition parties, just like the LSK, which worked in close collaboration with the FORD opposition party towards the abolition of the single party state system. This goal was achieved in 1991 but they had to wait ten more years before witnessing political transition through the victory of the Rainbow Coalition10 and the election of its candidate Mwai Kibaki on 27 December 2002. Once again, Willy Mutunga played a critical role as a facilitator, working with another lawyer, Kivutha Kibwana. The two of them succeeded in convincing divided opposition parties to form an alliance promoting democratization and the fight against corruption. After the victory of this alliance, the other main objective of this generation of activists was a constitutional reform; it materialized on 27 August 2010 with the promulgation of a new Constitution, an outcome of two decades of mobilizations. Willy Mutunga, one of the craftsmen of this text, could not stop there. He decided to commit himself to the application and defence of the Constitution by vying for the position of the President of the Supreme Court. His candidature was in line with his will not to turn into a “professional critic” – a reproach he had made to some civil society members – and to put in practice his principles. However, this was ambitious. Despite his undisputed honesty and robust legal training, he had never been a judge, was proud of his “radical” activist path, and found himself at that time in a middle of a divorce11 after a hectic private life (he was married twice, and he had two children out of marriage). These things may have displeased the conservative camp of President Kibaki. However, at that time Kenya was in an unprecedented political situation: after the post-electoral violence of 2008, Mwai Kibaki shared his executive power with his opponent Raila Odinga, appointed as the first Prime Minister to put an end to the crisis. This coexistence played in favour of Willy Mutunga. After trying in vain to impose his own candidate, Mwai Kibaki finally agreed to present to the Members of Parliament the candidature of Willy Mutunga, who had the support of Raila Odinga. In exchange, Keriako Tobiko, close to the conservative camp, obtained the key position of Director of Public Prosecutions. Even with his prestigious position, which made him one of the most powerful personalities, Willy Mutunga remained on the fringes of the Kenyan establishment. He did not frequent the luxurious Golf clubs of the capital, high social places of the political and economic elites12, preferring to spend his evenings alone or with friends, such as cartoonists Gado and Maddo. Mocked for his diamond on the ear, he refused to remove it when he became Chief Justice in June 2011. In a country alternately run by Kikuyus and Kalenjins, with the Luos stationed in the opposition, he comes from the fifth largest tribe in the country, the Kamba. Moreover, he is a Muslim when more than 70% of the Kenyan population is Christian. His atypical profile made him try other professional experiences before his ascension to the Presidency of the Supreme Court. Disappointed by the turn taken by the Kibaki Presidency, he joined the Ford Foundation in 2004, moving to the donors’ side. He had not absented himself from the public debates, which he participated through a weekly column in the Saturday Nation, under the alias Cabral Pinto – a double tribute to the revolutionary Amilcar Cabral from Guinea Bissau, assassinated in 1973, and to Pio Gama Pinto, a journalist and a Kenyan political activist, killed in 1965. Appointed to the Supreme Court in June 2011, Willy Mutunga did nothing to fit in. Defying the reluctances, he decided to abolish the wig for judges and to change their red robe, both inherited from the colonial years. These measures aimed at showing Kenyans that the justice could come closer to the public. The effect of surprise of his appointment and the relative fragility of an Executive and a Parliament at the end of their service allowed him to put in place certain reforms quickly, like the computerization of the courts or the strengthening of the initial and continuing training for judges. He also introduced a periodic rotation of judges and the opening of many courts in regions that had been up to then totally abandoned by the Judicial Institution. The increase in number of judges and magistrates helped reduce the number of neglected files by half. However, this actual evolution of the judicial institution towards more independence and integrity had its limits. For the first time in his career, Willy Mutunga evolved in a professional environment that was widely hostile to him. Some incompetent or corrupt judges did not want to be pushed around. Known for his capacity of dialogue, his taste for collective thinking (which he described by the term “collective intellect”), Willy Mutunga was not at ease with conflictual situations. He witnessed the most difficult test of his career. In March 2013, the very close results of the Kenyan presidential election, which gave victory to Uhuru Kenyatta with 50.07% of the vote in the first ballot, was contested by his opponent Raila Odinga before the Supreme Court. The Chief Justice and the other Supreme Court Judges had to take the role of arbitrators of the political life and they were subjected to immense pressure, considering the fact that five years earlier the contested re-election of President Mwai Kibaki had led to terrible violence. After four days of debate, and a long day of deliberation, on 30 March, Willy Mutunga announced the unanimous decision of six judges of the Court: despite the irregularities observed, the re-run was ruled out and Kenyatta’s victory was confirmed. This announcement, which did not come with any legal explanation (it would be published a month later), was highly criticized by many members of the civil society, amongst whom were close friends of Willy Mutunga like Maina Kiai or Makau Mutua, who felt “betrayed” by one of them. In their eyes, this validation of a spoilt ballot was a very hard blow to the quite young constitution. The situation remained unpleasant for Willy Mutunga. Having rejected every criticism at first, he became more at ease and promised to return on this controversial decision after his departure from the Supreme Court13. A little after, Willy Mutunga also had to face a media after one of his close colleagues, in charge of Judicial Administration (Chief Registrar), Gladys Shollei, was accused of embezzling funds. She was dismissed from her position in October 2013, with the approval of the Chief Justice. At the end of 2015, Justice Philip Tunoi, a Judge of the Supreme Court, was accused of Corruption14 and Lady Justice Kalpana Rawal, a judge and the Vice President of the Court, was accused of tax evasion during the revelation of the Panama Papers15. The Supreme Court and its President were weakened by this series of tests. Especially since the political configuration had changed since 2013, with a new Kenyatta-Ruto Executive in office which was less favourable to the new Constitution. Many laws going against the spirit of the new Constitution were voted by the Parliament, restraining press freedom or hardening financing conditions for certain non-governmental organizations. In October 2015, Willy Mutunga announced that he was going to take an early retirement, in June 2016, while he could have stayed in office for one more year until his 70th birthday. Having crossed all the upheavals of Kenya’s political life and avoided being tainted by any scandal during the five years he spent as the head of the Supreme Court, Willy Mutunga became more than ever before a mentor for youth activists. Boniface Mwangi, one of the most prominent activists today in Kenya, considers him a “comrade”20 in struggle and cites him as one of the personalities who inspire him in the same way as the Mau Mau leader Dedan Kimathi21. Willy Mutunga appreciates this role of a mentor that he had already played for Makau Mutua or Maina Kiai and intends to pursue it just as he wishes to teach and to travel to share his experience. Marie Wolfrom is a journalist; she works for AFP (Agence France-Presse) in Paris and was based in Kenya for several years. Unless otherwise stated, the citations in quotes of this article arises from interviews with the author, realized face to face in February 2014, or through a regular electronic correspondence. The article was written in 2016 and does include recent change. Hélène Charton, “Réformes éducatives et légitimation politique au Kenya”, Cahiers de la Recherche sur l’éducation et les savoirs (online), October 2011. John S. Saul, born in 1938, is a Canadian activist and a Political Scientist, very committed to the South African Liberation Movements. Walter Rodney, a Guyanese Political Activist and a Historian born in 1942, is the author of the famous How Europe Underdeveloped Africa: A Political and Historical Analysis of Underdevelopment (1972). Issa G. Shifji, “Remembering Walter Rodney”, Monthly Review, 01/12/2012. After Gandhi’s and Nerhu’s activism in India, who were both lawyers, the British colonial authorities refused to give scholarships to African students willing to study Law, a course which was not taught in the first East African University, Makerere. Stanley D. Ross, “The Rule of Law and Lawyers in Kenya”, Journal of Modern African Studies, Vol. 30, No. 3 (Sep. 1992), p. 421-442. He also worked with Willy Mutunga at the Kenya Human Rights Commission. The National Rainbow Coalition (NARC) converged the National Alliance Party of Kenya and the Liberal Democratic Party. In July 2000, Willy Mutunga got married for the second time to an American Student, Beverle Michele Lax, whom he divorced in 2011. Dominique Connan, La décolonisation des clubs kényans : sociabilité exclusive et constitution morale des élites africaines dans le Kenya contemporain, PhD Thesis, 2014. Interview with John Githongo on The East African, 20 October 2015. “Uhuru Kenyatta appoints tribunal to probe Justice Tunoi”, Daily Nation, 23 February 2016. “Deputy CJ Rawal among high profile Kenyans with firms in tax havens”, Daily Nation, 4 April 2016. Uhuru was not in particular a supporter of the decentralization established by the new fundamental text, and his vice-president William Ruto had campaigned openly for a “no” during the constitutional referendum of 2010. Boniface Mwangi is a photographer who became known for his pictures denouncing the 2007-2008 post-election violence. He now manages the PAWA 254 organization which converges artists and activists who are involved in the fight for Social and Human Rights. “Chief Justice Willy Mutunga condemns teargasing of CORD protesters”, The Standard, 26 April 2016. Koert Lindijer, African correspondent of NRC Handelsblad, published an English version of this interview with Willy Mutunga on the African Arguments website, 11 January 2016. Interview with the author, February 2014. Dedan Kimathi Waciuri, born in 1920, was one of the main leaders of the Mau Mau uprising against the British colonization in the 1950’s Captured, he was executed on 18 February 1957. Erased by the official history of the country for a long time, he is today known as one of the independence heroes.